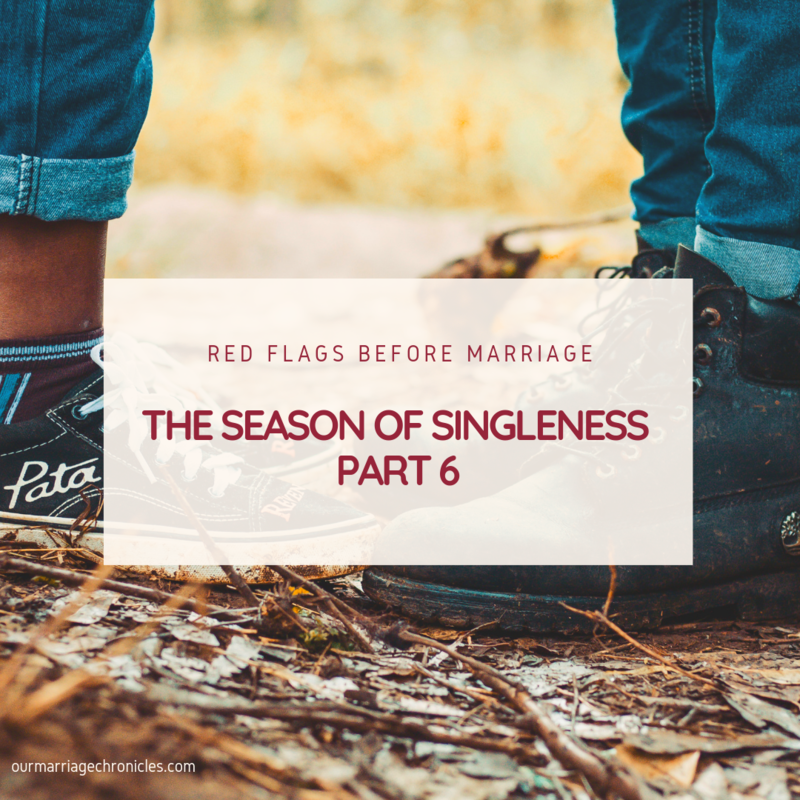 THE SEASON OF SINGLENESS – PART 6- RED FLAGS BEFORE MARRIAGE. Our dating and courtship journey with Johnny was not without its fair share of drama. We used to fight if not everyday, weekly, when we were best behaved. It was healthy since our weaknesses were largely exposed then, but then very unhealthy on some level because we were both two egocentric people who believed in our own individual ways. None of us would budge. Egocentricity took center stage, and was quickly choking down our growth. Well, the more we interacted the more we realized that we cannot simply deem ourselves as sufficient enough to steer on our own. Our growth, always hit a plateau phase and that was a serious red flag. A relationship begins to die the moment it begins to stagnate. Love is organic. It doesn’t remain static. It either grows, or withers and dies. Yes, It was our relationship, but there is foolishness in thinking that you can “do it alone” – especially in relationships that have a goal of marriage. We took drastic measures, decided to walk with our Pastor throughout our dating and courtship journey, and a couple whom we gleaned much wisdom from. That was a positive step and one that impacted us till now. The caption was and is, “we have to grow, and grow deeper, higher and wider.” Those intentional and deliberate efforts to grow in every sphere of our lives has made our marriage healthy. It is not perfect, we still do argue and disagree on a couple of issues, but the fact that we are committed to grow makes the environment conducive to sort out our mess. Personal growth between two distinct individuals and as a people committed to a journey that will lead into marriage, cannot be overstated nor overrated. Am talking about growth. So many people who are in the season of singleness do not really ask and do not seek out knowledge that would make them grow, but are very apt in seeking out information that would make them comfortable. Information and knowledge that would justify whatever they are doing wrong and that would suit their itchy ears. 2nd Timothy 4:3. You see itch ears, as Paul puts it, are ears that do not like hearing the truth. They would rather seek out people and lifestyles that condone their behavior. The truth is too huge a cross to bear and illuminates’ deficiencies that they would rather not face, and that is easier than doing the actual work of “pruning off” bad fruits. Am talking about personal growth. If you are in a relationship that saps you more than it re-fills you, drains you more than it energizes you, instead of challenging you to be better it degrades you, a relationship that pulls you down rather than build you, I highly suggest taking a rein check on it. Actually, it’s time to think about an exit strategy. It is just not enough to “feel” in love, but both of you should be committed to growth in every sphere of your lives, individually and together. Interests makes you interesting. People who are committed to grow go beyond what feels comfortable and familiar to them. They seek knowledge, and knowledge that will tilt them towards growth. Two people who are dedicated to growth have a higher success of a healthy marriage. Intentional growth is not as spontaneous as many people think. It will take the two of you to sit down and pen down your expectations, your weaknesses and what you want your relationship to achieve in the long haul openly. It more about doing the right things now that you have your right fit. For personal growth to happen, both of you need to be adaptable, flexible, have a teachable heart and adopt a posture of humility. Humility seeks out but pride will draw out – which would you rather have? We think we know before marriage. We think we are equipped because emotions are just impostors of the reality. Don’t be side tracked. Just because your mam and dad have a 30-year-old thriving marriage doesn’t make you qualified for marriage, it positions well to make smart choices. Your background sure does contribute to how you view marriage and how you will treat your spouse, but it takes more than that. It takes personal commitment, deliberate efforts to do, to grow to glean wisdom. You two are there to sharpen each other for marriage. No just strolling around malls hand in hand giggling while not putting any efforts towards growth. Being adaptable means that if the person you are in a relationship with brings in a suggestion that adds value to both of you, don’t be so quick to trivialize or shut it down. Listen to him or her first. For instance, one of the common issue we find with people is the issue of Pre-marital counseling. The scales are tipped more towards the men. There are so many men out here who think that Pre-marital counseling is a waste of time. That because “it is their relationship”, then someone else shouldn’t tell them what to do. Who tells you that Pre-marital counseling is about being given methods, something like, “Ten steps towards conflict management.” Pre-marital counseling is more about being equipped with the unchanging principles of marriage, that never change and have been tested with time, and refined by seasons. Digging your heels in when asked to go for counseling before marriage, is a pure recipe for disaster. You can never know enough especially in marriage matters. The first year presents different scenarios that the 3rd year of marriage would not. The 5th year presents different challenges that the 7th year of marriage would not. So you have to be committed to push through the learning curves. Unfortunately, those in the season of singleness are so good at informing, telling you how they feel about this person but have barely stocked up for the future through learning for growth. Worse tragedy, most are doing nothing about it. Feelings are good, but you cannot build on feelings. It’s akin to building on quick sand. The bible says in Proverbs 12: 15 The way of a fool is right in his own eyes, but a wise man listens to advice. You might think you know but you don’t. So go for Pre-marital counseling. Say, “I want to know”, “I want to grow”. Do not build on your curb appeal so much that you forget what is of the greatest importance. You are in charge of you. Grow you. If your relationship doesn’t add any value to you in terms of growth, then there is no point of stringing each other along. Dating and courtship have a purpose. Knowledge, building, character evaluation and gaining clarity of this person for future preparation. If they are adamant about growth, that is a sure indicator that they will be obstinate in marriage. It will be their way or no way. You don’t want to commit to that. You shouldn’t commit to that. “But I can change him/her.” No you can’t. That is big fallacy. You cannot change anyone but yourself. So if you choose someone who thinks they “got it all covered”, chances are that you will stagnate for the biggest part of your marriage life. “They get so angry. She switches off her phone for days or he ignores me for days”. That tells you automatically that there is an issue to address. No! you don’t become an enabler to that kind of persistent chronic behavior by always thinking that you are the one on the wrong, you address the issue with clarity and grace. Those are clear pointers that your relationship needs to be weaned. You need to grow and you cannot grow on milk alone. A time comes that those little immature acts have end. “They are growing but not as fast as I want.” Sure, that’s positive. Cheer each other on. As long as they are fluid, nor matter the viscosity, cheer each other on. Stagnation is what is dangerous. Watch out for stagnation. Check your conversations. What do you two talk about often other than how you feel towards each other? Are you afraid of pointing out his or her mistakes lest you fall out with each other? Humility is being able to take in gracious rebukes or corrections. Its in being able to answer all questions that you might be asked without getting so defensive or getting weary. You will understand that this person wants the best for both of you in a relationship and correction brings growth. If they don’t want to be corrected, always throwing outbursts of anger, shutting off or down when something is pointed out, then growth will not be achieved. If it persists for long, then that’s a potential red flag. Don’t cover it, don’t sit on it! If fear drives your relationship more than “perfect love” then you have no business being there. Perfect love – not limited to feelings -casts out fear and the one who fears is not perfected by love. – 1st John4:18. That kind of love is the love that is patient, kind, does not keep a record of wrongs but also rejoices in the TRUTH. Are you two telling each other truths’ about the flaws you have seen or observed? If there is no change no matter how much you love this person, marriage will not know that. Set the pace now. Set the ‘sops’ now. They should be an incredible addition to your life. You should grow as an individual and you should grow as you two, then together, you will be a force to reckon with. Don’t just fall in love, be love smart too! Watch your growth curve.